The Gilded Slipper: Keep Your Eyes Young! Lately, I've had trouble sleeping. Maybe it's the winter, the fact that it's dark so early. Whatever the cause, I generally tend to oversleep this time of year. So, what to do with those tired, puffy eyes? Well, how about some 1930s advice from The Daily Mail? "Eyes show the strain of life before almost any other feature." Very true! How often have we been reminded that the skin around our eyes is delicate and tender, yet we still continue to rub them, squint, and expose them to merciless sunlight. And letting them swell up after sleeping in doesn't do much good, either! 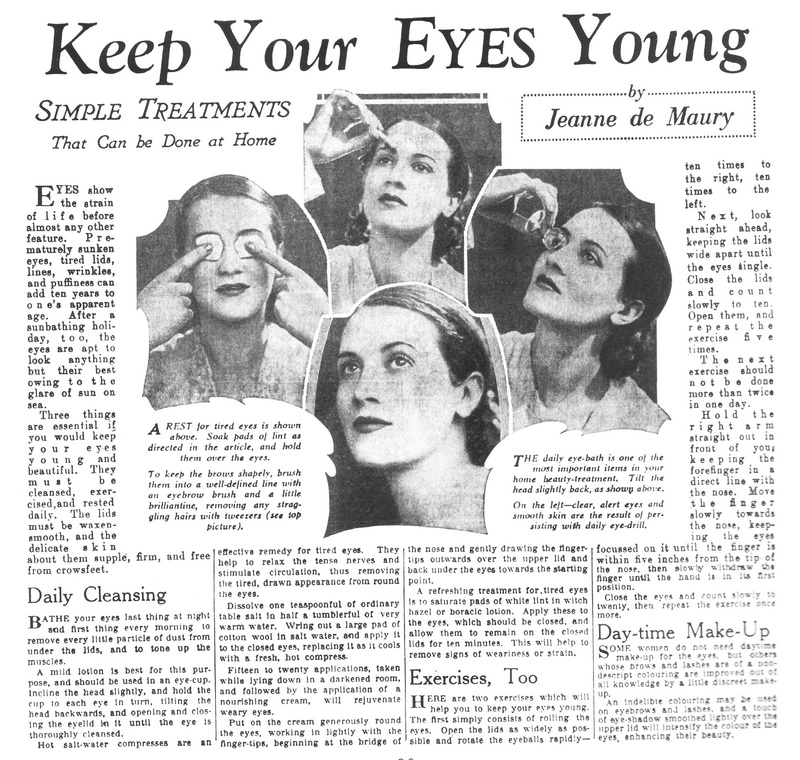 According to the above article, "three things are essential if you would keep your eyes young and beautiful. They must be cleansed, exercised, and rested daily." Let's divide this into sections! 1. Daily Cleansing of the Eyes. "Bathe your eyes last thing at night and first thing every morning to remove every little particle of dust from under the lids, and to tone up the muscles." 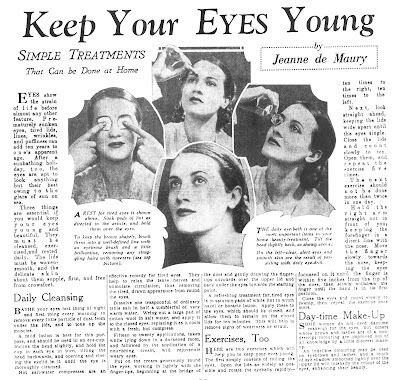 As shown in the photo at right, it is recommended to wash eyes with an eye-cup filled with a "mild lotion". This doesn't mean the lotion you put on your skin! What I use: spring water combined with rosewater. It sounds wild, but I have given up commercial eye drops in favor of this concoction. I have also heard of tea made from the herb eyebright, diluted with water, but have never tried it. As always, be sure to research whatever herb you consider before actually using it. Two exercises: First, "open the lids as widely as possible and rotate the eyeballs rapidly--ten times to the right, ten times to the left. Next, look straight ahead, keeping the lids wide apart until the eyes tingle. Close the lids and count slowly to ten. Open them, and repeat the exercise five times." Second exercise: This "should not be done more than twice in one day. Hold the right arm straight out in front of you, keeping the forefinger in a direct line with the nose. Move the finger slowly towards the nose, keeping the eyes focused on it until the finger is within five inches from the tip of the nose, then slowly withdraw the finger until the hand is in its first position. Close the eyes and count slowly to twenty, the repeat the exercise once more. "Hot salt-water compresses are an effective remedy for tired eyes. They help to relax the tense nerves and stimulate circulation, thus removing the tired, drawn appearance from round the eyes." At first, I was skeptical. But I tried it a few days in a row and it seems better than putting ice cubes on puffy eyes. Since puffy eyes are often the result of excess fluid pooling there overnight, wouldn't it make more sense to use a warm-treatment method to get the fluids flowing? But I should warn you--DO NOT GET THE SALTWATER INTO YOUR EYES. It will burn like you can't imagine. Okay? Here we go. "Dissolve one teaspoonful of ordinary table salt in half a tumblerful of very warm water." (I used one teaspoon in one cup of water.) Dip two cotton balls or pads in the water (I have used folded pads of paper towel when I'm out of the cotton), wring them out, and apply these to closed eyes, "replacing as it cools with a fresh, hot compress." The article recommends fifteen to twenty applications while in a darkened room. Keep in mind that the compresses cool very quickly, so fifteen to twenty will probably take only a few minutes. Next, apply a nourishing cream around the eyes, working in lightly, "beginning at the bridge of the nose and gently drawing the fingertips outwards over the upper lid and back under the eyes towards the starting point." Another refreshing treatment is to apply cotton compresses soaked in witch hazel to closed eyes for ten minutes. I've yet to try this, but witch hazel is known for its soothing, cooling properties, so it's definitely something I need to try. Well-kempt, defined eyebrows and appealing daytime make up are also key. Some do not need daytime make up, but if you like to use a touch of shadow on the lids and discreet penciling on the brow, this will enhance your eyes, as well!